No need to look at the calendar: If the world is about to end, you can be pretty sure that summer’s almost here. As the temps rise, so do the odds that you’ll see some really big things blow up, be swept away or get pulverized—again. Alas, London. Nice knowin’ ya, New York. Woe is Washington, D.C. 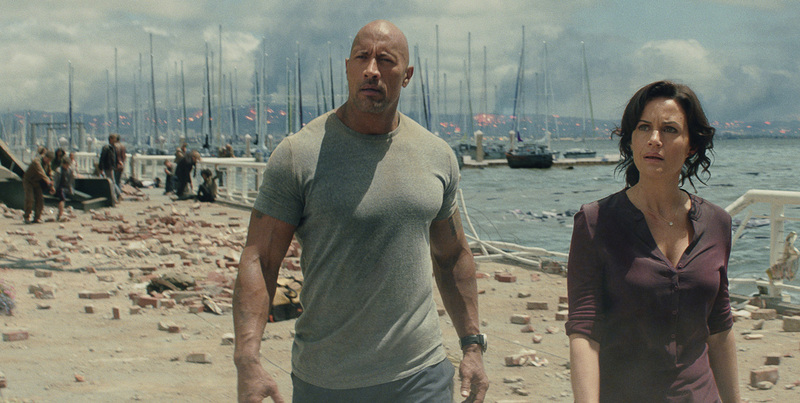 In San Andreas, named for the famous fault line that runs through much of California, a monstrous earthquake turns both Los Angeles and San Francisco into pancake-like piles of rubble, creates a tsunami that takes out the Golden Gate Bridge and—symbolism cue—dramatically reunites one “split-apart” family. This adrenaline-pumping summer blockbuster really busts some blocks, literally. It starts off with a rockslide, and in just a few minutes, we’re watching the Hoover Dam explode in a heaving, slo-mo convulsion of concrete, rebar and water. 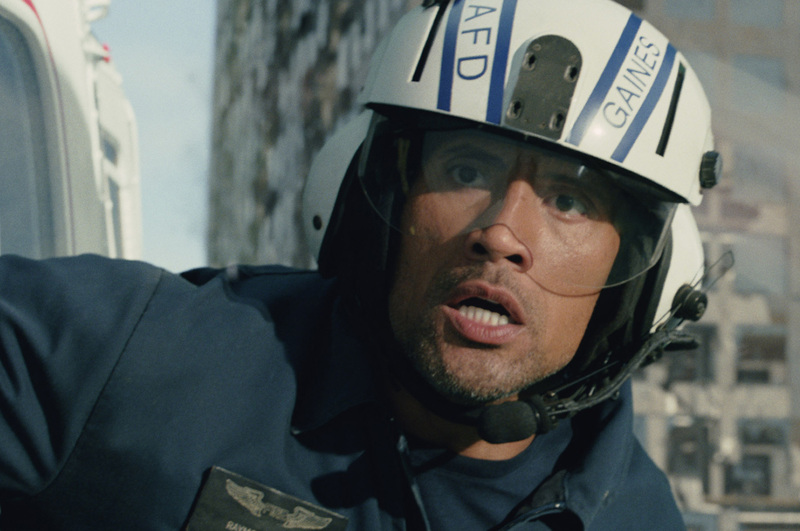 Dwayne “The Rock” Johnson is Ray, an L.A. helicopter-rescue pilot, whose plans for a pleasant weekend drive to take his daughter Blake (Alexandra Daddario) back to college are disrupted by gaping chasms, toppled, flaming skyscrapers and collapsed, crumbled interstates (not to mention what must be countless victims that, curiously, never seem to require his services). Ray’s wife, Emma (Carla Gugino) has filed for a divorce and is about to move in with a filthy-rich real estate developer (Ioan Gruffudd), who turns out to be every bit the weasel the movie leads you to think he’ll be. Before the big shake-and-bake, Blake meets a couple of oh-so-charming Brits, a resourceful young engineer (Hugo Johnson-Burt) and his bright little brother (Art Parkinson). In movies like this, meetings like this usually pay off later, and this one certainly does. Duck! 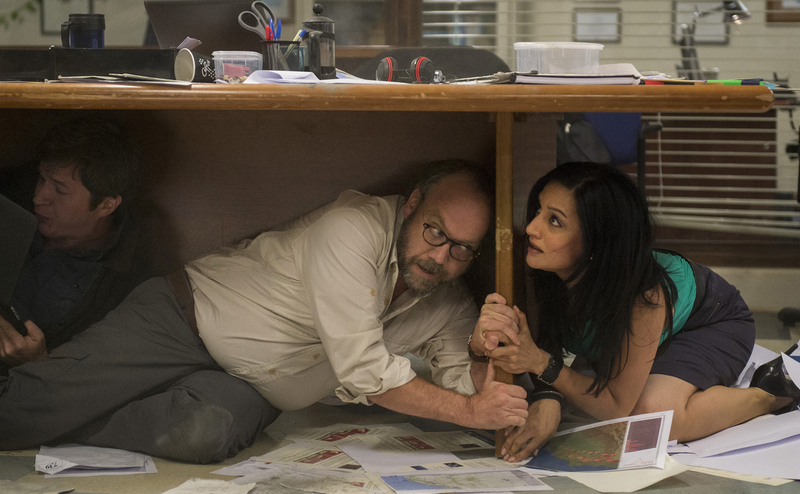 Paul Giamatti takes cover with a TV reporter (Archie Panjabi from TV’s ‘The Good Wife’). Paul Giamatti is a data-streaming seismologist who predicts the Big One. (“No one listens to us until the ground shakes,” he glumly tells a TV reporter.) Australian pop singer Kylie Minogue has one scene, in a fancy, high-rise restaurant, where she basically gets to chat, scream, run and plummet. The earth shakes, the oceans rise, buildings topple and fall. But this is clearly The Rock’s show, which is why the screenplay by Carlton (Lost, Bates Motel) Cuse weaves plenty of personal drama into the disaster, and much of movie concerns Ray and Emma’s search for their missing daughter-in-distress. And believe me, if the world is ending, The Rock is the guy I want on my team: A mountain of muscle with a heart of gold, he can rappel out of a hovering helicopter and leap from a zooming airplane, hotwire a pickup truck and pilot a boat through a tsunami, and even bring someone back from the dead. He’s The Rock and The Man. Art Parkinson, Alexandra Daddario and Hugo Johnson-Burt stay afloat. Some of the effects are impressive, but really: We’ve seen it before. And we’ll see it again. “So, what now?” ponders Emma as she surveys the CGI rubble and ruin. Ray, looking out over San Francisco Bay at the exact moment a gigantic American flag is unfurled from the wreckage of the Golden Gate Bridge, has the answer. “We rebuild,” he says. Yes! In time next summer, and the next disaster movie!